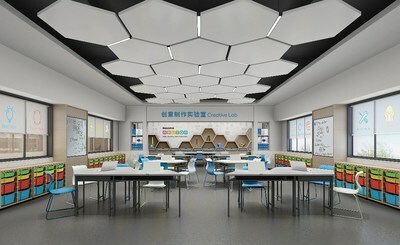 SHENZHEN, China, Nov. 14, 2018 /PRNewswire/ — Makeblock, the leading STEAM education solution provider, is announcing their collaboration with Gratnells, world renowned classroom storage system, to provide a cutting-edge STEAM education solution for the Chinese education market. Makeblock will be working with Gratnells to provide convenient and advanced STEAM classroom management systems, create exciting classroom spaces that engage students, allow managed access to resources, and inspire creativity. Makeblock is a multi-national company with over 500 employees and subsidiary companies in the U.S., the Netherlands, Japan and Hong Kong. It has worked with over 1,600 global channel partners and forged business in over 140 countries and engagements with Microsoft and strategic partners such as Japan’s SoftBank C&S. More than 20,000 schools worldwide have benefited from Makeblock’s STEAM solution. For the past 40 years, Gratnells has partnered with international leading school furniture makers that create and commercialize furniture models using the tray storage system. Gratnells trays have proved very popular and can now be seen in almost every classroom. Gratnells’ international award-winning, BSI tested trays are designed for heavy educational use. The trays come in 12 colors and four different heights (F1 shallow tray 3 in., F2 deep tray 6 in., F25 extra deep tray 9 in., and F3 jumbo tray 12 in. ), allowing teachers to choose the storage that suits their needs. Although all Gratnells’ trays are built to last, they are all fully recyclable. For more information please log onto www.makeblock.com and www.gratnells.com. Founded in 2013, Makeblock Co., Ltd, is a leading STEAM education solution provider. Their mission is to help people turn their ideas into reality and to take education to the next level. Offering easy-to-use programmable robot kits, an electronic building block platform, a Maker robotics platform, courses and visual programming apps, it aims to help children unleash their full potential. By developing these hardware and software products and operating events, Makeblock greatly lowers the threshold of creation so that everyone can realize their ideas and enjoy the experience of creating. Gratnells is the world leader in school storage solutions, designing, developing and manufacturing award-winning storage systems for the educational market. Specializing in school storage and working with strategic partners from leading furniture manufacturers to advanced STEM kit suppliers, the Gratnells tray has become the iconic storage system of choice, adopted by schools and equipment suppliers in more than 65 countries. Gratnells has also expanded their primary and secondary frames and carts ranges to include nurseries and early learning centres, as well as becoming one of the leading suppliers to hospitals and health service providers.